By now, you’ve likely heard the news of the startlingly high number of Common Murres washing ashore in Prince William Sound and beyond, as well as the reports of murres flying inland to the Mat-Su and elsewhere. 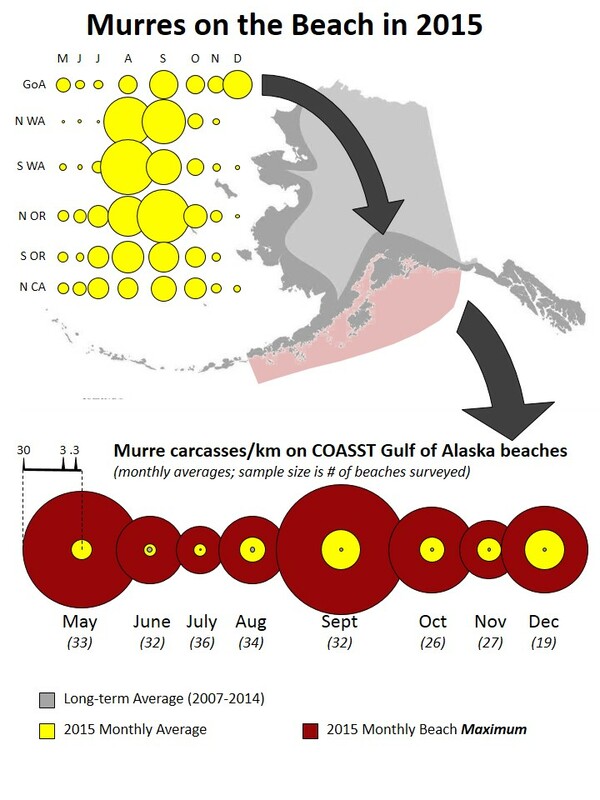 In fact, many of you have been out there on affected beaches in Homer, Seward and elsewhere counting the bodies and collecting our baseline data. Thank you for those efforts, and particularly during the dead of winter. 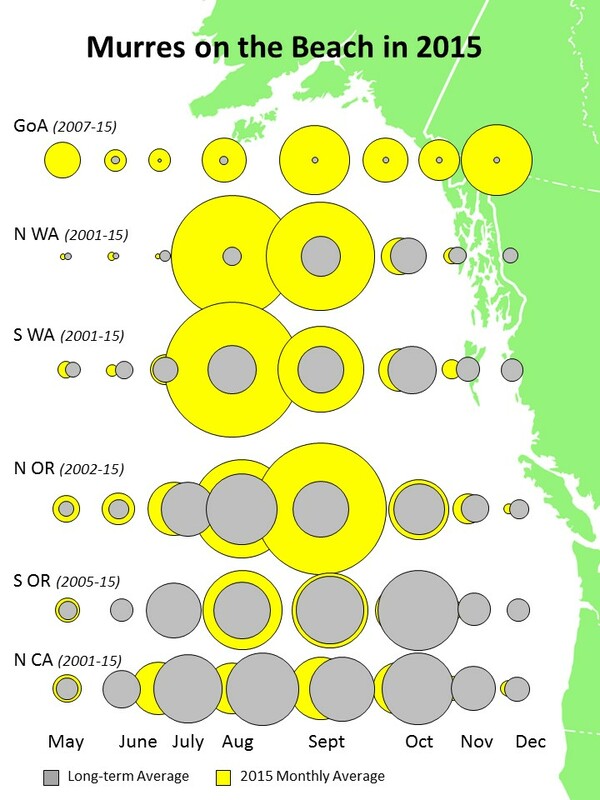 We don’t know at this point why the murres are coming inshore, and why they are so stressed. It is obvious that the huge die-offs reported after New Year’s day were exacerbated by a large storm that no doubt pushed many a bird past it’s limit, and definitely pushed all floating material up onto the beaches especially in long fjords (think Seward and Whittier). There are many folks working on this story, including state, federal and tribal agencies, university scientists and others. 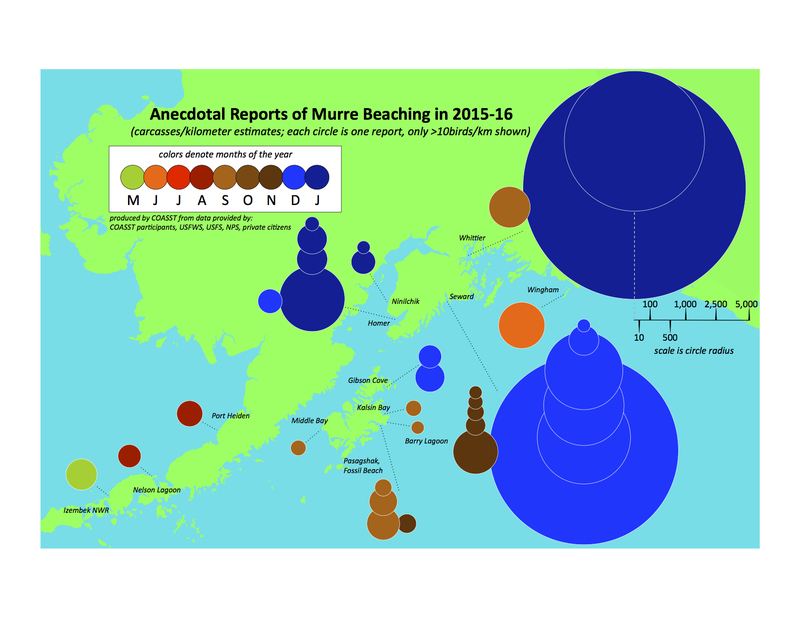 In fact, as we type this, many of those scientists are gathering in Anchorage at the Alaska Marine Science Symposium, where several talks will center on the murre story. Each and every one of you should know that the COASST data in AK forms the baseline against which these elevated counted can be (and are being!) measured. It is the data you and others before you patiently collected year in and year out that tells us exactly how many murres should normally be washing ashore (precious few!). Thank you! Here is the latest infographic, showing the anecdotal reports that we’ve put together. This entry was posted in Uncategorized on January 25, 2016 by coasst. This entry was posted in Beached Birds, Uncategorized and tagged common murres, wrecks on January 7, 2016 by coasst.